My May Julep Maven box was really exciting to go through, since there were a couple of new products from Julep inside. I went with the Boho Glam box for this month, and along with the nail colors my box contained the Plié Wand™, which I was eagerly looking forward to trying ever since Julep first introduced it a few months ago. Paulette: I am so mesmerized by this nail color. The lilac color is simply stunning and so perfect for the spring and summer months. Paulette also contains slight golden shimmers, that just glisten on the nails. I love it! Jeanne: I don't know what it is but lately, I have been gravitating a lot towards blue nail colors. I have always longed for the perfect light blue creme nail polish, and I think I have finally found it! Jeanne is a super flattering color on, and the formula is even better. Creamy, smooth, and very opaque. 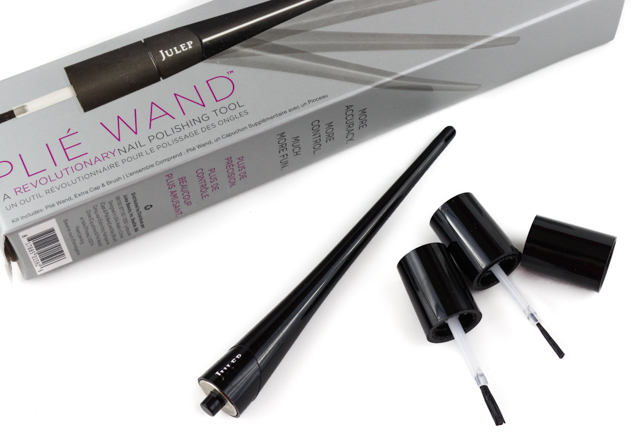 The Plié Wand™ is a new revolutionary tool that helps facilitate nail polish application. It contains a long handle that improves leverage, and is comfortable and easy to hold. The handle contains an ergonomic design that allows it to bend, thus resting in the crook of the hand. This feature helps some when it comes to applying polish with your non-dominant hand. I had the chance to try the Plié Wand™ and I must say, I am really enjoying it so far. It does take a little getting used to but once you get the hang of it, the outcomes really speak for themselves. I found that my nail polish application was not only effortless, but neater too. I definitely felt like I had total control when using the Plié Wand™. Along with the Plié Wand™ I also received two Plié Wand™ Precision Brushes, and an over-cap that will work with my other Julep nail colors, so I can use the Plié Wand™ with them as well. The Plié Wand™ precision brushes are much wider and shorter in length than the usual julep brushes. I like the regular Julep brushes, and I do like these newer ones as well. These cover more area, and they allow me to get closer to the nails and obtain precise results. I decided to add on the Plié Wand™ Creativity Kit to my box. The kit includes a striping brush, and a dotting tool. I want to experiment more with nail designs, and this kit is just perfect to do just that! The dotting tool is really neat; you can easily create larger or smaller dots with the rounded tip. It's really fun and adds a cool touch to a nail look. The striping brush is handy to have for french manis, swirls, and more intricate striping designs. Here is a fun nail look I came up with using Paulette and Jeanne (two coats of each + top coat), and the Plié Wand™ tools I received. I absolutely love how it turned out! The white creme polish is Brigitte and the black creme is Cleopatra. Both are also from Julep. 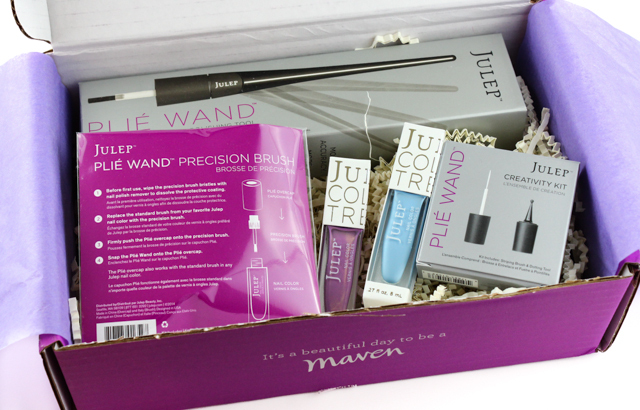 If you are interested in signing up for your own Julep Maven box, you can do so, here. You can get your first box for free (just pay shipping) by using the code FREEBOX at checkout! What did you all receive in your May Julep box? What do you think of Plié Wand™?